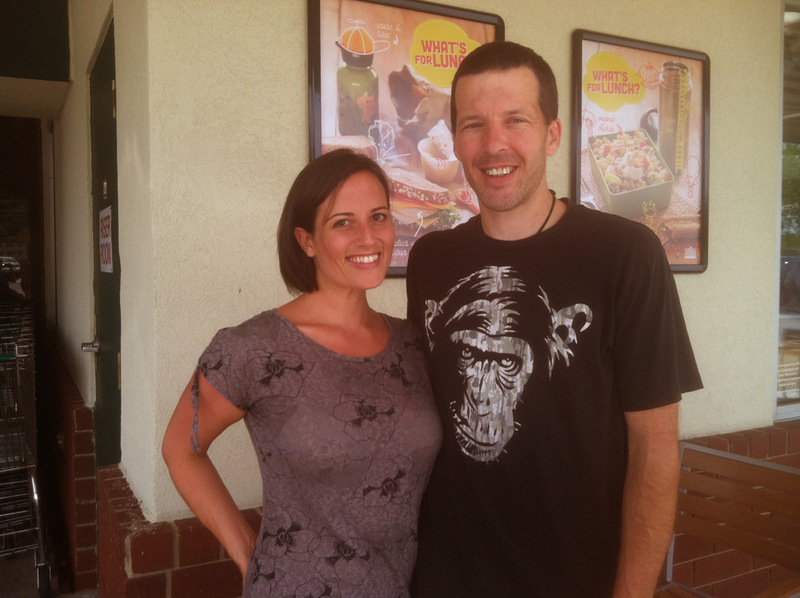 Matthew Daniels and Jane Howard Crutchfield are dedicated to providing people in the Triangle with healthy, raw foods. Matthew is a skilled chef with more than 20 years of experience in the food industry. He&apos;s been cooking for himself since he was a kid due to a severe food allergy to onions. Jane Howard has been vegan for over 15 years and challenged herself to try the raw foods diet for a week. Little did she know that a week would turn into a year and a successful business with Matthew, Triangle Raw Foods. Triangle Raw Foods is a weekly delivery service and food truck providing people in the Triangle with raw, dairy-free, meat-free and gluten-free foods. Raw foods are not cooked over a temperature of 105 degrees in order to preserve all essential enzymes for your body and digestive system. All of the dishes are also prepared using all-natural and organic ingredients with produce coming from local North Carolina farms. 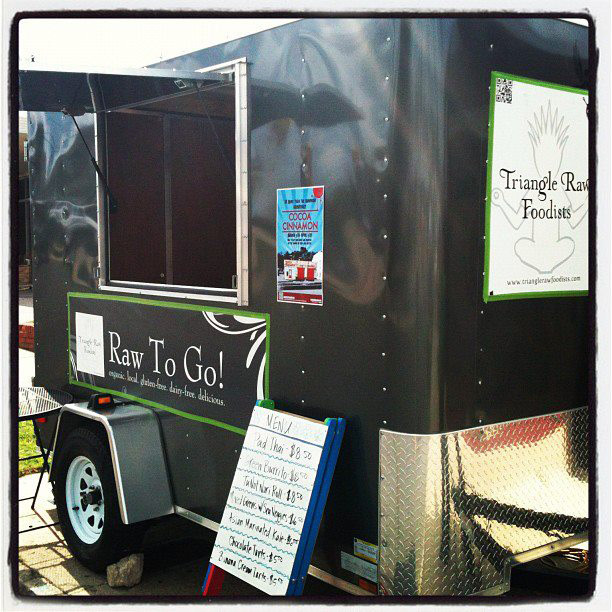 I was thrilled to try a few items from the Triangle Raw Foods truck. The pad thai is one of the most popular dishes. The “noodles” are made using zucchini and carrots then topped with a thai dragon chili sauce, which has a wonderful spicy flavor along with hints of lime, cilantro, and garlic. 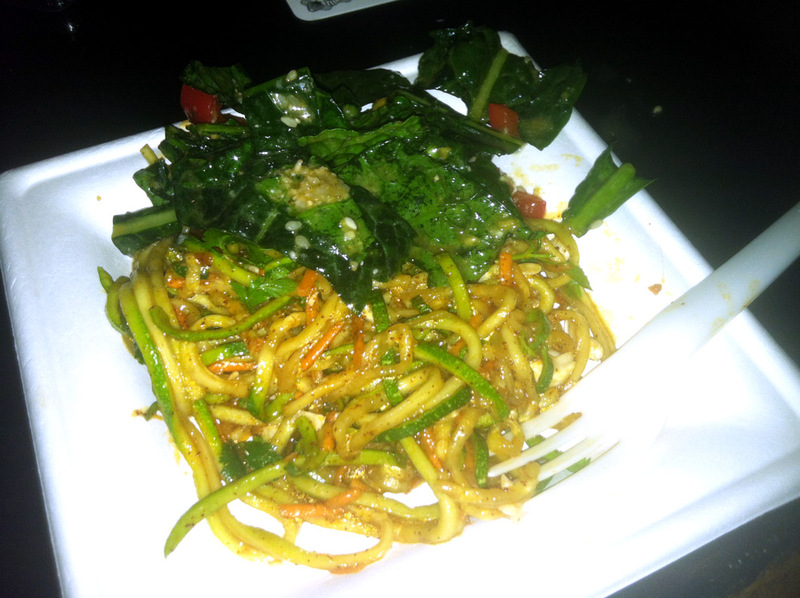 One of my favorite dishes was the marinated kale. Dino kale and red peppers are marinated in a mixture of sesame oil, brown rice vinegar, orange juice, ginger, garlic, tamari and cayenne. I am fairly new to the raw food scene and was shocked to discover how tasty raw foods can be when prepared with creativity and passion. Matthew is a creative genius in the kitchen, always coming up with new and unique raw food recipes. Seriously, who would have thought to make a “mac and cheeze” with yellow squash noodles and cashews or a “green burrito” using a collard leaf? Thanks to Matthew, the menu is large and filled with eclectic raw food dishes. The portions are also generous; Lyndsay and I were able to split the pad thai and marinated kale dishes with some leftover, which we brought home in the compostable containers. If you’re looking for something to satisfy your sweet tooth and to provide you with energy, raw food desserts are a must. Finally, dessert that is actually good for you! Triangle Raw Foods offers a wide variety of desserts including truffles, cakes, tarts and mousse. The truffles are a huge hit and numerous flavors are available like chocolate sea salt and Mexican chocolate. 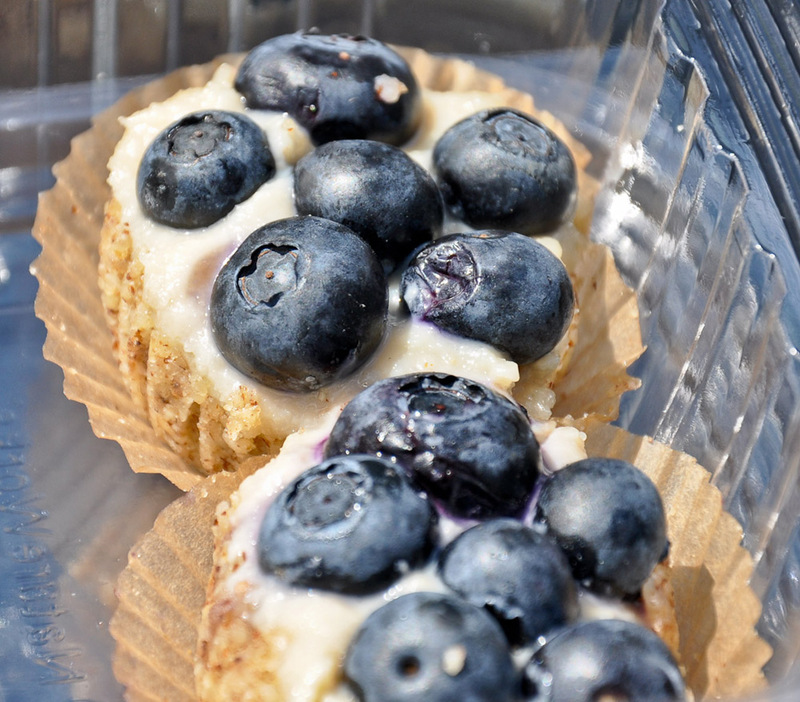 Triangle Raw Foods also offers seasonal tarts like blueberry, pumpkin pie and banana cream. Yes, I’ll take one of each please! I usually steer clear of energy or protein bars because I’m not a fan of their chalky texture or taste, but Matthew and Jane Howard gave me a sample of their brand new ginger snap hemp protein bar. The bar was moist and tasted like a gingerbread cookie! The bars are perfect to eat after a workout or for a mid-afternoon snack when you’re in need of an energy burst. 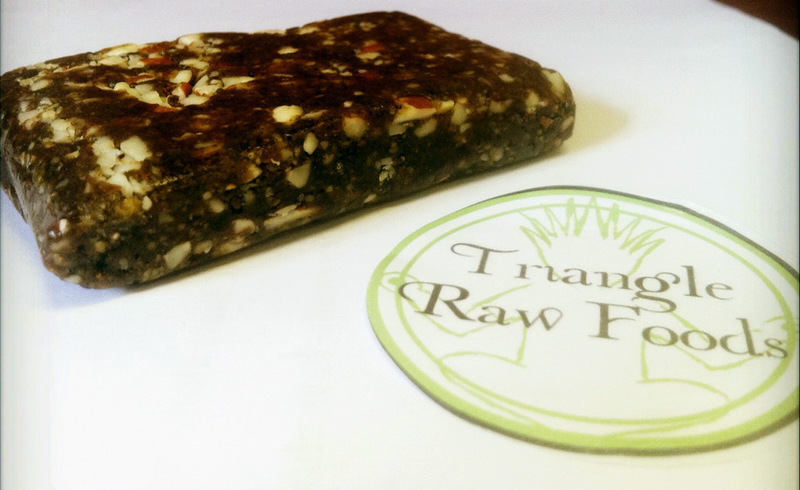 By now you’re probably wondering where exactly can I find Triangle Raw Foods in Raleigh? Thankfully, you have a few options. You can order your favorite dishes online for pick-up every Monday at the Whole Foods on Wade Avenue. The food truck is always parked at Roth Brewing Company the third Friday of every month and you can follow Triangle Raw Foods on Twitter or check their website to see where the truck will be located next. If you can’t make it to the truck, check the LoMoMarket schedule; they carry Triangle Raw Foods Wednesday through Saturday. Triangle Raw Foods is also hosting a tasting party at the Anvil Gallery in downtown Raleigh on Wednesday evening, August 29. If you are new to raw foods, the tasting party is a great way to sample a few dishes for the first time. I hope you can make it because I know you’ll be impressed with the wide variety of innovative and delicious raw foods!